The water cycle. The sun is very important as it gives the heat which evaporates the water. Image source: Wikimedia Commmons. This blog is for all those people learning science out there, especially Emily and the girls learning about the water cycle at Walford. Have you ever wondered what happens to a raindrop once it falls from the sky? What happens to it depends on where it falls. It may fall in a river or a lake, which flows out to the sea. In the sea, the warmth from the sun evaporates some of the water. This turns the water from a liquid (like in a glass of water) to a gas (like the steam that comes off a kettle), called water vapour. This water vapour will hang around up in the sky until it finds a little speck of dust to stick on to, forming a raindrop. When it rains, this water will fall back to earth as a raindrop. If it’s very high or very cold, the rain may fall as snow or hail. In some very high mountains, like Mount Everest, or Mount Cook in New Zealand, it is too cold for the snow to melt. It may squash together over many years to form glacier ice. A glacier can store ice for hundreds or thousands of years, until one day it may melt and be evaporated by the sun, to fall as rain again. Some of the rain that falls will trickle through the soil. Some of this water will be absorbed by plants, which will help them grow, but some will continue going deep down under the soil. It will end up as groundwater which is water stored underground. 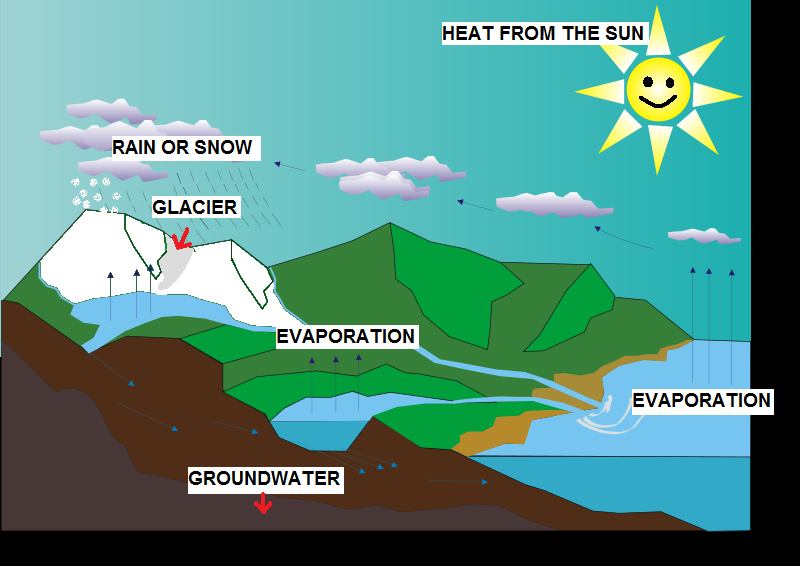 Because there is no evaporation underground, the water may stay as groundwater for thousands of years. If we didn’t have water, nothing on earth could survive. So who needs water? Humans! Did you know that a person can only live for one week without water? In many places around the world, water doesn’t flow from a tap. Out of the whole world, one in six people do not have safe water to drink. Fish: Fish need to stay wet, and they need water to breathe. In Australia, the small hardyhead fish was saved from extinction (when all of the same animal dies, so there are none left) when their river dried up by scientists who caught them all and looked after them at LaTrobe University. Frogs: Many types of frogs like damp places. They lay their eggs in water so when the eggs hatch and the tadpoles are born, they can stay wet and have water to swim around in. Other animals: The platypus is a great swimmer and diver. It needs water because the bugs and other food he eats live in water. 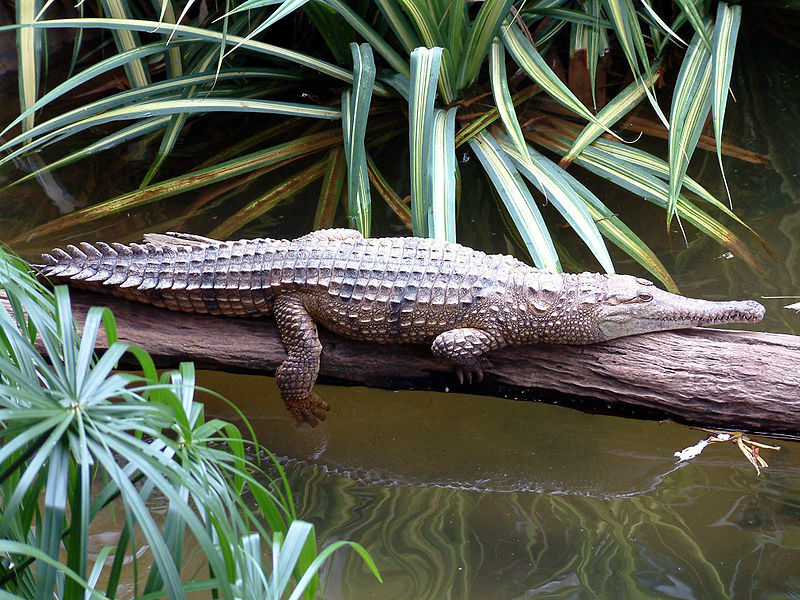 The freshwater crocodile lives in wetlands and billabongs, and unlike his cousin the saltwater crocodile doesn’t usually bite humans. We need to look after out lakes and rivers, so all the animals that live in them can be safe and happy, like this freshwater crocodile. Photo source: Wikimedia Commons. Why might we run out of water? Overuse: Sometimes we use more water than there is. Farmers growing crops and cities taking water for drinking often take so much water there is nothing left for the other animals! Also, when lots of water is taken from lakes, the water left behind gets very salty, and you cannot drink it (its like drinking seawater). 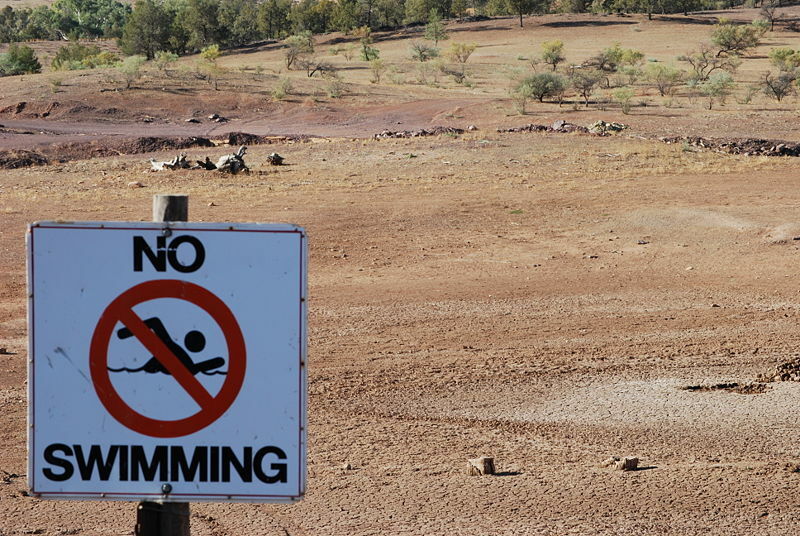 In Australia, the Marray Darling Basin has lots of water taken from it, sometimes, only a little bit is left behind. Pollution: Often drains and gutters flow out to rivers and seas. Rubbish and nasty chemicals that go down them can hurt the animals which live in the water. And people cant drink it or swim in polluted water either! Climate Change: Some places in the world are getting warmer. This means that more evaporation occurs, and less rain falls to replace it. Because of this, some rivers and lakes might dry up. How would you feel if your swimming pool dried up? Both people and animals need water to drink and swim in, so try to look after it for everyone! Photo source: Wikmedia Commons. Turn the tap off while you brush your teeth, it doesn’t need to go the whole time. If you shower, take a shorter shower. Also, tell Mum and Dad to! Only run the dishwasher or washing machine when it is full. Water the garden when the sun isn’t out to evaporate the water, so the plants can have a drink. Dont put nasty chemicals down the sink or in the gutter. This can flow out to sea and pollute the water and poison the sea creatures. If you have a tap at home that drips even if it’s turned off, ask your parents to get it fixed. A dripping tap can waste lots of water over a year. If you have any questions or interesting facts about water you would like to share, I would love to hear your comments!